If you enjoyed this interview make sure to check out our weekly actual play podcast where we’re playing through the Starfinder Dead Sun’s Adventure Path as well as the occasional Starfinder Society adventure! Welcome to another special edition of the Roll For Combat Podcast where we sit down and talk with Paizo Developer Eleanor Ferron. We discuss Eleanor’s many influential contributions to the Starfinder universe and her first Adventure Path! 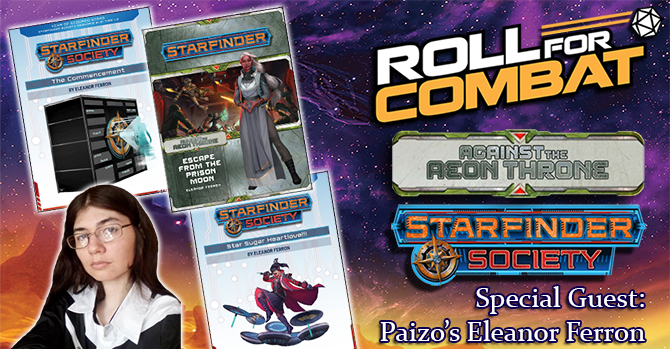 We discuss perhaps the most-played Starfinder adventure to date, Starfinder Society Scenario #1-01: The Commencement, and some of the secrets behind writing that scenario and designing the faction leaders. Of course we perhaps her most famous creation to date – Strawberry Machine Cake! Learn how SMC started out as a fun little side-note and then grew into a full-fledged Starfinder phenomenon. Finally, we discuss Eleanor’s latest adventure, the second book in the Against The Aeon Throne Adventure Path, Escape from the Prison Moon. We also discuss cuttlefish… that’s right, cuttlefish. Check it out!